iFactor Consulting, a leading provider of customer communications solutions for the utilities sector, has been recognized in the Gartner Cool Vendors in Energy and Utilities 2013 report. iFactor Consulting, a leading provider of customer communications solutions for the utilities sector, has been selected as one of four companies on Gartner’s list of “Cool Vendors in Energy and Utilities, 2013,” published April 22, 2013. Gartner defines a Cool Vendor as a company that offers technologies or solutions that are innovative, impactful and intriguing. iFactor’s solutions include Storm Center, an online and mobile-enabled map that provides outage information and links for customers to report outages; Streetlight Outages, an interactive map-based reporting system for streetlight issues; iFactor Mobile, a full line of utility-specific mobile apps for Android and iOS devices; and Notifi, a multi-channel customer communication and preference platform that enables proactive alerts and two-way conversations via mobile app, email, SMS text, and phone. iFactor Consulting develops customer communications solutions for the utility sector, delivering information to more than 100 million people in North America through deployments at more than 30 utilities. iFactor’s solutions allow utilities to leverage connected technologies such as the web, mobile web, and smart phones to interact with their customers. Visit http://www.ifactorconsulting.com for more information. 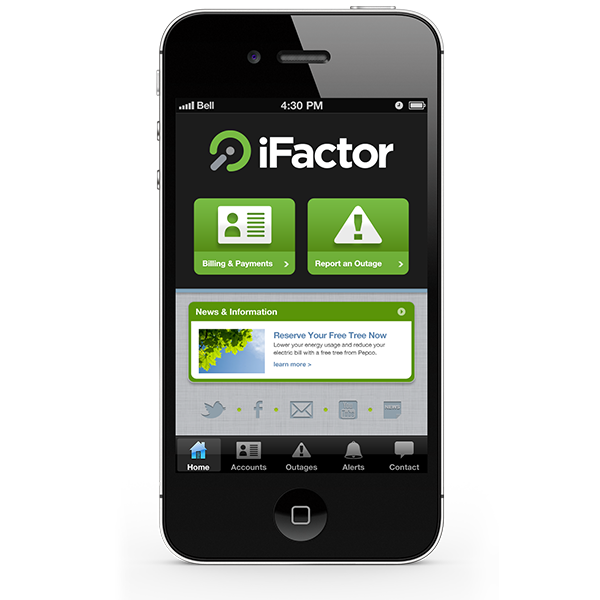 iFactor Mobile apps allow utility customers to manage accounts, make payments, report outages and view energy usage anytime, anywhere.